Emmarose Logatti, 6, had been going to Boston Children&apos;s Hospital for treatment and therapy since she had a stroke. 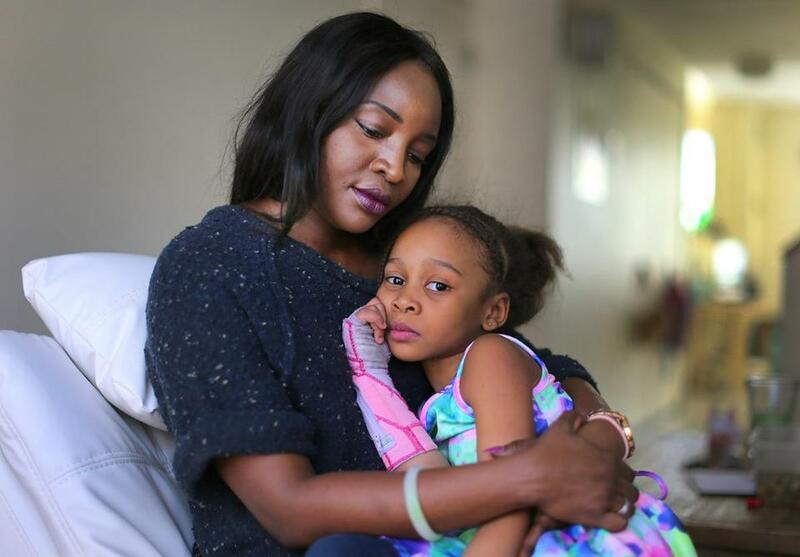 Her mother, Yande Schwarzbock, said the girl&apos;s insurer, Neighborhood Health Plan established new rules this year that meant Emmarose lost access to the hospital. Crystal Rivera’s son has the kind of health issues that would make any mother anxious: food allergies, asthma attacks, a skin condition. But 5-year-old Dacuarie Dillard was in good hands, seeing specialists at Boston Children’s Hospital, where he and Rivera had grown comfortable with his care. Things changed Jan. 1, when the family’s health insurer, Neighborhood Health Plan, began a new contract with Children’s that makes it more complicated for Dacuarie and thousands of poor children like him to see doctors at one of Massachusetts’ most prestigious hospitals, even as it becomes increasingly popular with wealthier patients from around the country and the globe. The new policy, one of many moves by insurers to control costs by restricting choice, applies toNeighborhood members on Medicaid, the government program for low-income individuals and families, known here as MassHealth, with tens of thousands of children possibly affected. Families like Rivera’s — those with primary care doctors outside the Children’s physician network — will have to give up their specialists at the hospital or find a new MassHealth plan. Either step brings with it stress for families already coping with caring for sick children. Rivera is taking her son to Boston Medical Center while she decides whether to switch to another plan that will allow Dacuarie to see specialists at Children’s. Neighborhood Health Plan, a division of the giant Partners HealthCare, is the biggest of six Medicaid managed-care plans, which are paid by the state to coordinate services for families on MassHealth. Neighborhood officials say they made the change because they can’t afford the steep rates at Children’s Hospital, which is one of the highest-priced Massachusetts health care providers. The contract maintains service for roughly 22,000 other MassHealth members who, unlike Dacuarie Dillard, already see primary care physicians within the Children’s Hospital network. Neighborhood has about 300,000 Medicaid members, including about 120,000 children. As the state and insurers seek to control health care costs, restricting choice for consumers has become an increasingly common strategy, not just for those with government-funded coverage, but also for residents with private or employer-paid plans. In some cases, that may mean not being able to see certain doctors. In others it could mean selected tests, drugs, and hospitals are off-limits. “MassHealth expects its [managed care plans] to build cost-effective and adequate network relationships that ensure access to care for members and make sense financially,” said Michelle Hillman, a spokeswoman for MassHealth. State officials also noted there is “significant price variation” among high-quality providers, making it possible to get equally good care at lower rates. Neighborhood isn’t the only insurer to limit access to Children’s Hospital. In 2014, Boston Medical Center’s HealthNet Plan, which also manages care for families on Medicaid, cut ties with Children’s and Baystate Health of Springfield, citing high costs. It lost 50,000 members after the changes. Tufts Health Plan requires prior authorization before its Medicaid members get inpatient treatment at any hospital, including Children’s. The state’s other three Medicaid managed-care plans do not include Children’s in their networks. Earlier this year, the national health insurer Aetna Inc. nearly ended its contract with Children’s because of a dispute about payment rates, but they ultimately came to an agreement. Under new rules at Neighborhood, most MassHealth members need prior approval from the insurer before they can access Children’s Hospital or its doctors. Such authorizations are rare. Neighborhood’s members can get pediatric care at several other hospitals, including Tufts Medical Center, Boston Medical Center, and Massachusetts General Hospital. (Like Neighborhood, Mass. General is owned by Partners HealthCare). Children’s Hospital executives said they provide significant level of care to children on Medicaid, and that they lose more than $100 million a year treating them, because reimbursements don’t meet all of their costs. Medicaid patients account for about one-third of Children’s revenue. Primary care physicians who treat children on Medicaid say the hospital and insurer should have found a way to maintain access for all members. For Riseberg and other doctors, the new policy also means they must be more selective about referrals, taking insurance rules into account, instead of thinking only about what is best for their patients. “This is the first time in the 12 years that I’ve been here that insurance has so directly limited my access to deciding which specialist is best for a particular need of my patient,” said Dr. Jeffrey Zaref, a pediatrician at Southboro Medical Group in Framingham. Meanwhile, families continue to face disruptions. Yande Schwarzbock’s 6-year-old daughter, Emmarose Logatti, has been seeing specialists at Children’s Hospital for most of her life to treat the effects of a stroke she suffered before she was born. When Schwarzbock learned that Neighborhood Health Plan was going to limit access to Children’s, she quickly dropped the managed-care plan and switched to another Medicaid program that offers more choice. “I can’t afford to go to another hospital, because these doctors already know her. I couldn’t afford to wait,” said Schwarzbock, 37, who lives in the South End.